Colors are so vibrant! Beiges in picture are actually a little more gray. Stunning stunning stunning! 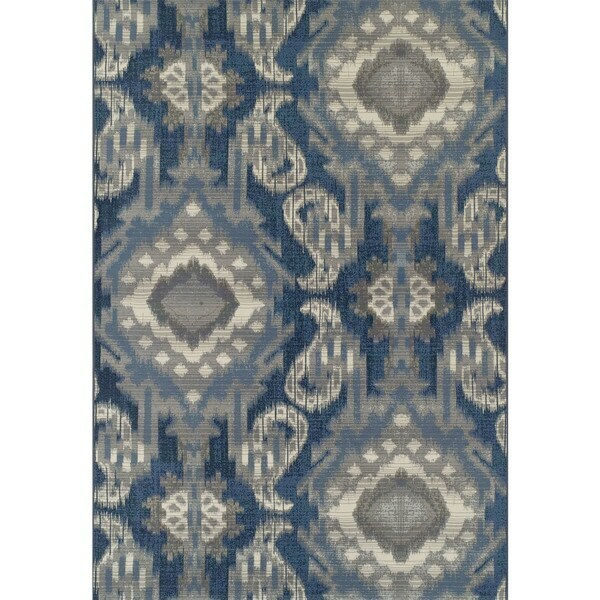 Embrace a boho vibe when you choose this area rug featuring an asymmetrical medallion pattern. Blue and grey hues provide a soft, cool color palette, and the polyester and polypropylene material offers carefree maintenance, whether you use the rug indoors or outdoors. This rug is beautiful! After laying it down the edges relaxed immediately. The material is softer than I expected which was a pleasant surprise. The colors in the picture are mostly accurate though mine has a bit of yellow running through it. The colors are perfect with the Gracewood Hollow Isaku Indigo pillows I also ordered from Overstock. This rug was a great purchase. I have spilled multiple things on it and it cleans up so easy! I think the pattern actually looks better in person and it was a great way to add color to my living room! I actually used it on top of my wall to wall carpet which worked great because of the low profile of this rug! Oh wow did these look great on the front porch of our farm house. They were exactly what was needed to warm up the space.. The color is true to picture. They are super durable.